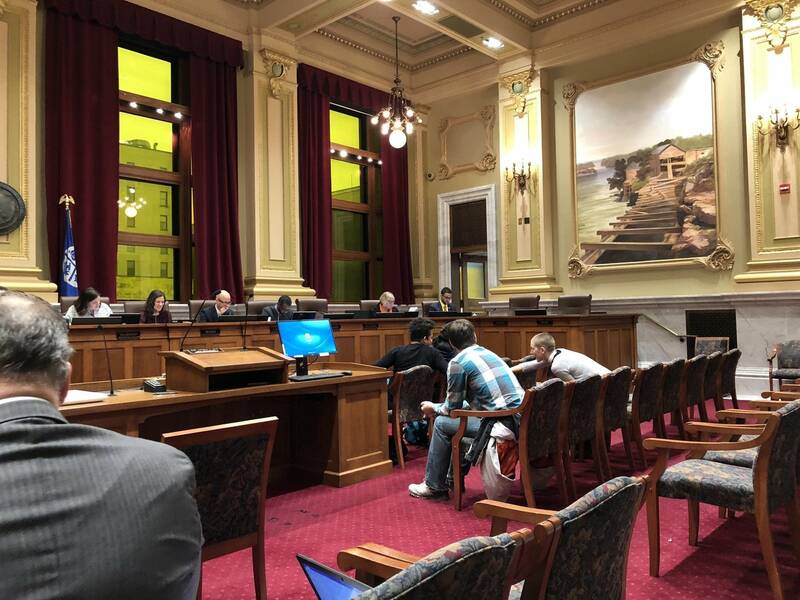 The Minneapolis City Council moved forward a proposal Friday that would fund community efforts to reduce violence by shifting funds from a Minneapolis Police Department program. The change to the budget proposed by Mayor Jacob Frey would eliminate the initiative to "civilianize existing sworn positions," removing funding for eight civilian employees from the police department. The $1.1 million from the initiative would be spread out over a number of different programs, including a new Office of Violence Prevention. The change would allocate ongoing funding to youth outreach, the Office of Police Conduct Review and a police department program that pairs officers with mental health professionals. The funding change would not affect the number of sworn officers in the city, according to the amendment's authors. Council Member Phillipe Cunningham said he wants the city to explore more public health approaches to public safety issues. "We need to be talking about prevention efforts, intervention efforts, as well as enforcement," Cunningham said, "but enforcement can also look different." The proposed funding change would also provide ongoing funding for "race and equity support," legal services for immigrants and refugees, and a program that aims to reduce domestic violence. "Where the evidence is showing it's working, let's invest in that, let's make it permanent, and let's continue to make that an ongoing priority," Cunningham said. Activists with a group called Reclaim the Block have pushed council members to shift more money from the police department to community programs that emphasize prevention and intervention. Group member Tony Williams said the activists are pleased that the Minneapolis City Council is starting to embrace different approaches to public safety in Minneapolis. "We hope that in the coming years, the mayor does as well, and that the city can move forward on a platform of true public safety for everyone," Williams said. "Not public safety for the rich, powerful and white at the expense of community members of color, trans community members, indigenous community members and other folks." In a statement, Frey said he looks forward to working with the council to adopt the final budget, but didn't say whether he supports the change. During the council hearing, Council Member Jeremiah Ellison noted that a 4th police precinct officer decorated the station's Christmas tree with beer cans, cigarette packages and police tape, and that signified how the police department needs to change. "When community members are saying they don't feel safe in this police department, and when community members are saying they don't feel supported by this police department, and when community members are saying we need different strategies for violence prevention, this is the type of thing that always instills fear in the community," Ellison said. Ellison acknowledged that the changes to the budget didn't go as far as some in the community wanted, but said it was a step in the right direction. The amendment was moved forward by a vote of 9-2 in the Minneapolis City Council's Budget Committee. Council Members Linea Palmisano and Lisa Goodman opposed the amendment. The final public budget hearing is scheduled for Dec. 5.